Kids Energy Powder is a proprietary blend of unique ingredients supplying the nutrients needed for optimal health of growing children. Growing kids has always bigger nutritional needs than others. 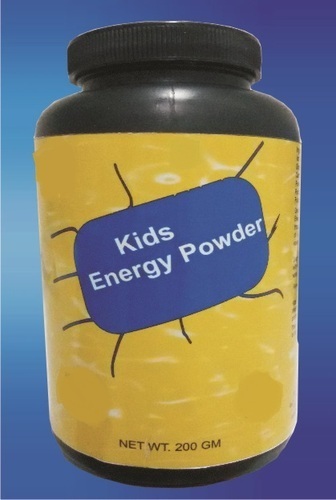 Kids Energy Powder gives your child the nutrition to keep them active throughout the day. Each delivers the powerful punch of essential vitamins and minerals along with essential amino acids. Key Ingredients: It contains Whey protein isolate, Pea protein isolate, Rice protein concentrate, Grape skin extract, Pomegranate extract, Cauliflower, Carrot, Garlic, Tomato, Kale, Papaya, Peach, Pineapple, Apple cider vinegar, Cinnamon, Wheat grass powder, Mangosteen, Beta- carotene, Vitamin C complex. Herbal Pharma Product leading provider of Unique Natural Healthcare Products like Capsules Drops, Exotic Juices, Powders,Tea, FMCG, Personal Care, Beauty and cosmetic products, Home Care Products, Weight Management Products, 100%, Organic Agricultural Products, Energy Saving Solution, Health equipments, and many more. All the Ayurvedic range of products is manufactured in our most modern manufacturing unit. Our manufacturing capacity of more than million stock keeping units (SKUs) per day having world-class facility and is equipped with Proprietary manufacturing technology. Its core focus is on manufacturing different formulations. This facility is equipped with all kinds of sophisticated equipments and trained manpower for carrying out the processes as per the international regulatory standards. This plant is dedicated for formulation of Ayurvedic products.